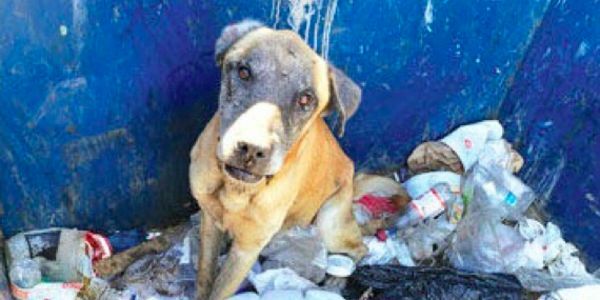 A sweet older dog was left abandoned and terrified in a dumpster outside a shopping complex in Arizona and the authorities have no idea who did it. Sign the petition to put pressure on the Bullhead City Police Department to find and punish the individual who harmed this creature. Things change, sometimes you thought you could adopt a dog and for one reason or the other you can't care for that animal anymore. But that's what shelters are for, it's not an excuse to abandon or abuse an animal. But this mastiff was an older dog, which means he could have some health problems that are expensive, and the owner may have just decided he wasn't worth the money or effort. Or, there could have been physical abuse on this animal and then when the people were done, they just dumped him. Either way, what they did was wrong and illegal. And we need to be sure local authorities are taking it seriously. Sign now to keep the pressure on.